Shortly before the summer of 2018, the company’s flagship, Honor 10, was presented in London. More than half a year later, the Lite version was launched on the market. The Honor 10 Lite could occupy a good position in the middle class, even if it hardly differs from other models. Even if it’s a Lite version, you can enlarge the smartphone instead of shrinking it. After all, the Huawei subsidiary now uses a 6.21 inch display. For comparison: Honor 10 has a 5.84 inch screen. Nevertheless, the resolution remains high. 2340 x 1080 pixels make it comfortable on the IPS panel, so we’re talking about a Full HD+ resolution. But you reduce the notch. Like almost every manufacturer, you now also rely on a so-called “Waterdrop” or “Dewdrop” notch that is placed centrally on the upper screen. This should result in an overall screen-to-body ratio of over 90%, even if it is somewhat unclear how Honor is calculated here. On the other hand, the back hasn’t been changed as much. Again, Honor relies on a Twilight back that is a real eye-catcher, at least if you choose the “Sky Blue” or “Sapphire Blue” variant. 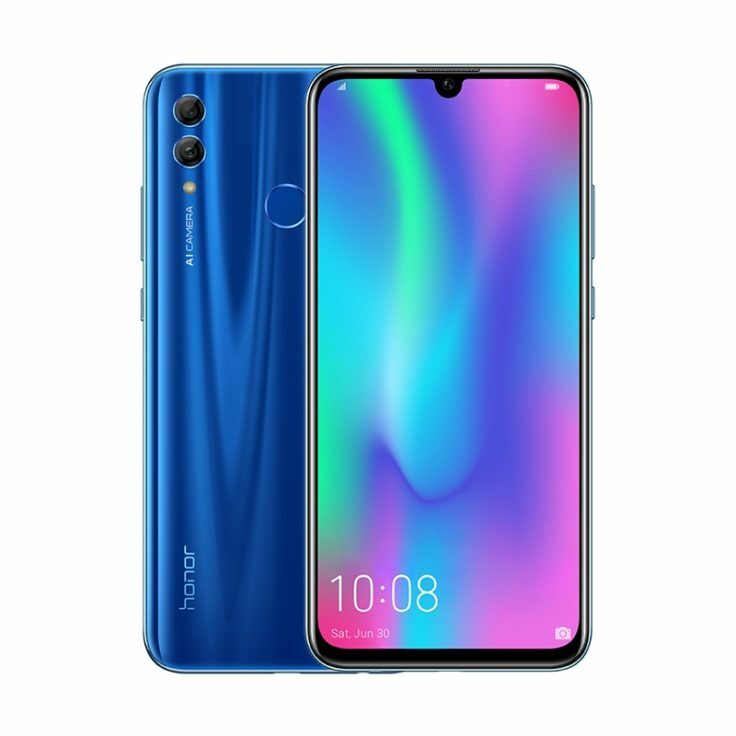 The color gradient of the Colorway “Sky Blue” is probably taken from the Honor Magic 2. The arrangement of the dual camera is slightly different, now you also rely on a vertical arrangement. In addition, the fingerprint sensor can be discovered, which, as with most smartphones, is located centrally in the upper third of the back. With a Lite version, you always have to make some compromises. Of course this is also the case with the Honor 10 Lite, but not quite as strong as you think. Finally, the in-house HiSilicon Kirin 710 processor is installed, which also sits in the Honor 8X. The performance is comparable with the Snapdragon 660, which sits for example in the Xiaomi Mi 8 Lite. And that’s more than enough for everyday use, gaming and multitasking. Especially in gaming, the GPU Turbo helps from Honor. Apropos multitasking: Honor, interestingly enough, only uses 3 GB RAM. Honor 10 already had “only” 4, but in times when a Lenovo Z5 Pro GT even sets to 12 GB, this move is surprising. But this audience apparently doesn’t want to pick up Honor. Instead, the user is given the choice to expand the memory of both the 32 GB and 64 GB versions by up to 512 GB. AI. Two letters that have become an integral part of Honors marketing strategy since Honor 10. The artificial intelligence should help the camera combination of a 16 megapixel and a 2 megapixel sensor to take great photos. Our test of the flagship has shown that this only works to a limited extent so far. After all, the camera is relatively fast with an aperture of ƒ/1.8. For video recordings you have to be content with a 1080p resolution. A little more value puts Honor on the 24 megapixel Selfie camera, which offers a ƒ/2.0 aperture. On the one hand, the connection possibilities reveal a look towards the future, but also an unnecessary downgrade. Instead of USB type C, the manufacturer relies on Micro-USB to charge the 3400 mAh battery with 10W on a 2019 smartphone. Unfortunately this is a bit weak. But there is at least NFC, a hybrid SIM slot and a 3.5 mm jack connector. Dual Band WiFi, LTE, Bluetooth 4.2 and GPS are also available. As always with Huawei or Honor Smartphones, EMUI is used as the operating system. This is a highly customized interface that deeply interferes with the system. However, the system on which this is based is fortunately Android P, Android 9. It’s nice to be up to date here. The Honor 10 Lite can probably gain some points in design, display and performance. Also the price is right. Especially NFC, memory expansion and headphone jack are useful features. But the difference to a Huawei P Smart 2019 or the Honor 8X is so small that the 10 Lite lacks a big unique selling point. If the price falls a bit, it could be an interesting alternative to the Xiaomi Redmi Note 7. Want a test?